I really wish I had appreciated Mariano Rivera more while he was playing. Let me clarify my statement. I have always been a big fan of Rivera but I am not a fan on the New York Yankees. I do not really have anything against the organization. I just always enjoy seeing them lose :-}. So it was hard to cheer for Rivera at times because of who he played for. Tonight was the end of an era. 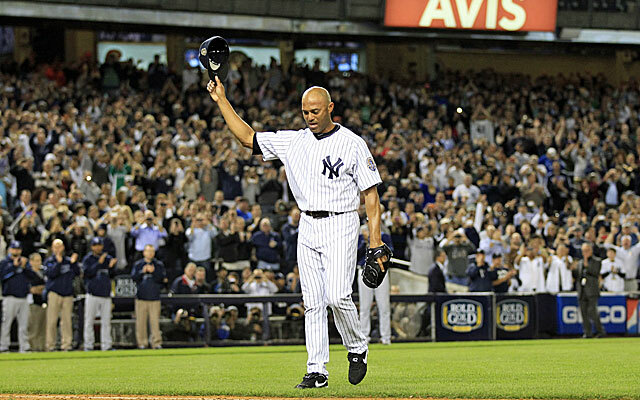 The last player to ever wear the #42 in Major League Baseball “exited” off the mound. How fitting that a man who has exemplified nothing but class, humility and dignity gets to be the last representative of such a prestigious number. You know you have something special when your rival has a special ceremony for you in your last game at their field, which is exactly what the Boston Red Sox did on September 16. I was shocked that none of the major networks carried tonight’s game. In a time when all that seems to be highlighted in sports are liars, cheaters, law breakers, whiners, performance enhancement users, drunk drivers and adulterers, you would think MLB would be chomping at the bits to ensure that such a momentous occasion would be broadcasted nationally. Thankfully because of social media sites such as Twitter, many of us did not have to wait long to see Rivera’s last pitch. And what a moment that was. Rivera entered the game in the 8th inning and retired all four players he faced. And then it was time. If you are not familiar with the routine in baseball, the manager always comes to the mound to relieve the pitcher. Well, Rivera is too special to just do things the normal way. Instead of the Yankees manager, Joe Giradi, relieving him, long time teammates Andy Pettitte, who will also retire at the end of the season, and Derek Jeter received that honor. 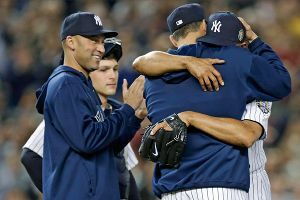 Rivera whom smiled as the two approached the mound was immediately overcome by emotion as he hugged Pettitte. 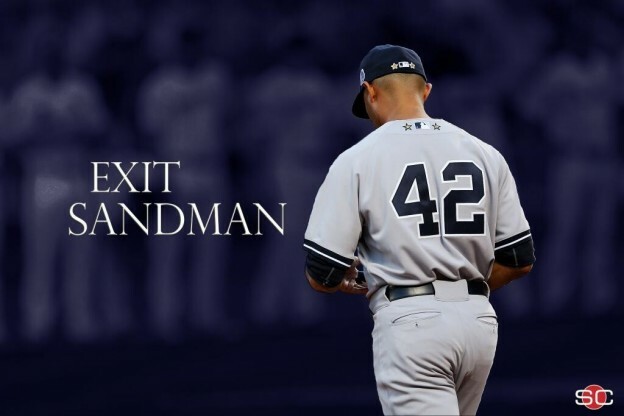 So was I. Rivera, who received a standing ovation that was over four minutes long, took it all in as he hugged teammates, coaches and Yankees personnel before he took the field again for one last curtain call at Yankee Stadium. In case you missed it, Rivera’s number read like this…19 MLB seasons(all with the Yankees), 652 career saves(most in MLB history), 2.21 career ERA(lowest in MLB history with a minimum of 1,000 pitches), 0.70 ERA in postseason(best ever in MLB history) 42 career postseason saves(24 more than any other pitcher), saved games for six Cy Young winners(tied for most all time). On Sunday, September 29, the Yankees will play their last game of the season, officially ending the Rivera era. There are rumblings that he may play center field for at least one inning during the series in Houston. Why not? He has earned it!!! Exit #42. See you in Cooperstown.